When a footballer hangs up their boots, the news reports often read like obituaries. However, it is only one part of their professional career that has passed away. And, like any personal upheaval, the full ramifications are rarely felt until a good few months have passed. 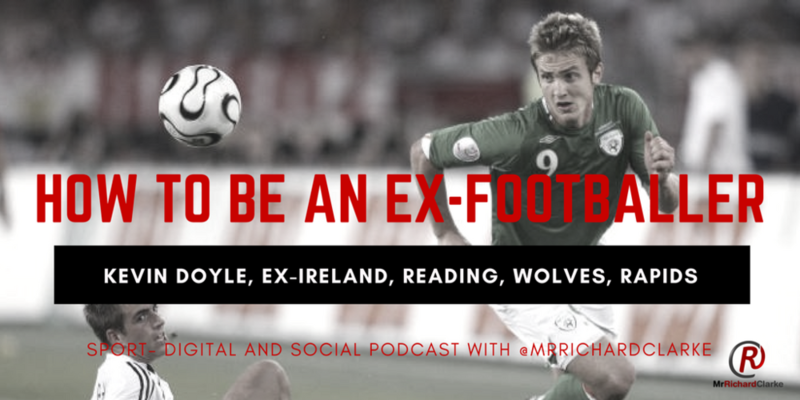 Kevin Doyle was forced to retire from football in September 2017 at the age of 34 after suffering complications over concussions. An intelligent, hard-working striker, his 16-year career including successful spells at Reading, Wolves and, in the US, where our paths crossed at the Colorado Rapids. Doyle also won 63 caps for Ireland, scoring 14, with the highlight being his involvement in Euro 2012. Doyle’s decision to call time drew tributes laced a tinge of sadness, given the enforced nature of his retirement. But, a few months on, how is he feeling? How is he reassessing his life and career? Where is he going next? And how does it feel to be a former footballer? 2.45 The story of Kevin’s retirement. 7.40 The statement that opened up a debate – deliberate or not? 27.41 Is there a desire to paying your dues? 34.20 Do you still like football?